Force Motors have launched two versions of their Force One SUV. The EX and SX versions are the next generation of the Force One originally launched in 2011. The EX features a BSIII compliant Mercedes OM 616 derived 2.6-litre direct injection turbo engine with 82PS and 230Nm, same as the Gurkha. 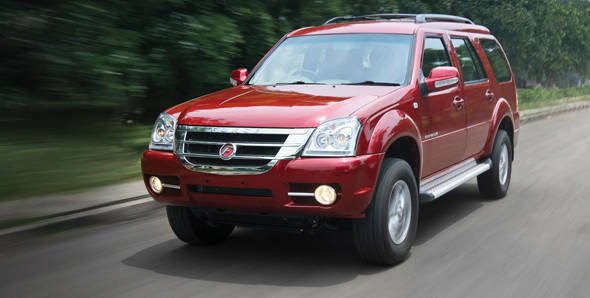 It's the entry-level model that targets the rural sector as either a private vehicle or an upmarket taxi. The SX on the other hand features a Mercedes BSIV compliant 2.2-litre common rail diesel with a variable geometry turbo. It makes 141PS and 321Nm. It's aimed at urban markets and sports daytime running lights and roof rails. It also gets ABS, EBD and driver and passenger airbags as standard. We managed to get behind the wheel of the SX variant and took it for a short a short spin around Pune. The engine is tractable with good low-down grunt that comes in at just 1400rpm. This meant that in traffic around the streets of Pune, second and third gear were sufficient without the need for selecting first gear too often. It's a good thing too as the clutch pedal action is on the heavy side. The gear throws are not quite as long as the Force Gurkha though the shift action requires a firm shove to slot it in or else it hops out of gear. The steering, on the other hand, is light and quite precise. Ride quality is also good with small potholes and speed bumps being taken in stride and very little felt in the cabin, but it does get a little unsettled over larger bumps. The credit, as Force Motors staff point out, goes to Lotus Engineering UK who helped design and tune the suspension for the Force One. The cabin is a noisy place though, and the poor sound-proofing manages to let in a lot of the ambient noise along with engine clatter and turbo whistles. The quality and fit and finish of the interiors are also not great and the hard-touch plastics are not well put together. Both new variants will go on sale from August 16th and the EX will retail at Rs 8.99 lakh (ex-showroom pan India) while the SX variant will retail for Rs 11.99 lakh (ex- showroom Pune). If you were disappointed that there is no 4x4 variant available yet, Force Motors will be opening sales of the top-end LX trim complete with all the bells and whistles in a month. It will take on the likes of the XUV5OO W8 AWD and Tata Safari Storme 4x4.